LEARN FROM INDUSTRY LEADING INVENTORS AND BUILD YOUR OWN IoT APPLICATION! This innovative course bundle is taught by Tech Talent South and Enventys, a full service product development powerhouse. At Tech Talent South, we pride ourselves on being the most approachable and accessible tech education option. We exist in cities all over the nation with a massive network of professionals who are inventing, upskilling, or jumping with both feet into a new arena of technology. Our number one priority is to know your name and know your goals! Enventys Partners has been a leader in product development and marketing for more than 15 years. They design, prototype, manufacture, source, fulfill, crowdfund and market new products. There are no better people to learn from about IoT! They spend their days developing the future of these products. What is an internet connected device? Common connected devices today are thermostats, refrigerators, pet collars, watches, and locks. These are just some simple examples! Anything that can be commanded to perform from a phone or computer is a part of this big network called the Internet of Things! In this class, you will learn how to create systems that talk to every day appliances and devices. This course bundle is comprised of two, 6 week sessions. Make that mobile application control a physical device! We'll create a user interface and design our application using Android Studio. We'll implement and build our application concepts using the Android SDK and Android's new programming language Kotlin. We'll test and deploy our final product to actual Android devices, so you can physically test your work and show off to friends! Discover what makes a great IoT product, explore required elements, and design your own project! Understand and implement the data, services and dashboards that will run your IoT project! Utilize a microcontroller and IoT development kit to build your own IoT tools to truly connect your life! 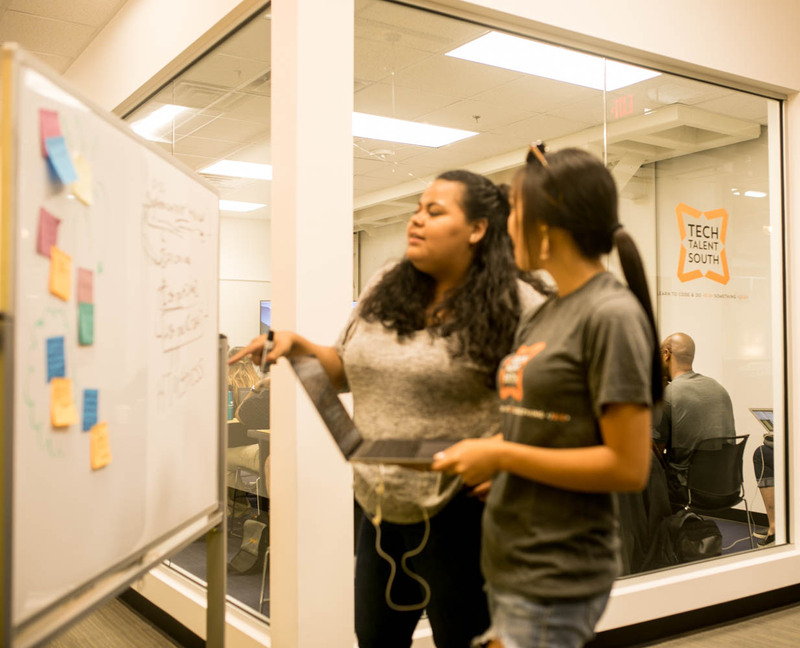 Tech Talent South has been teaching people like you to code for five years. Our students come from all different backgrounds with unique goals for doing something big! All of our students are driven by their motivation to build and create something they're passionate about.